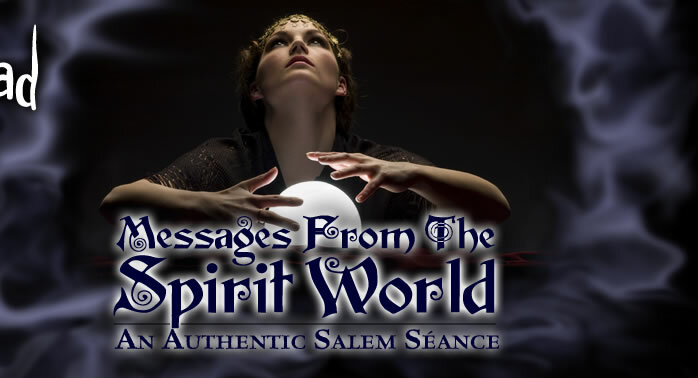 Messages from the Spirit World - An Authentic Salem Seance - October, 2012! Throughout October at OMEN - Dates Coming Soon! The séance will open with a blessing of protection and welcome those who have crossed over to visit. Participants will then be guided through a relaxing meditation to open the channels of awareness and synchronize everyone in the room to the spirit energies present. At this time, the medium will open herself to the messages of the spirits and guides. She may also employ automatic writing, psychometry, and other messages of communication to clarify the messages coming through. Bringing an object worn by the departed can be helpful in making a connection. A short time is also allowed for participants to share mediumistic messages that they receive, should they come through. While not everyone will necessarily get a message, everyone will experience the wonders of spirit communication in a classic Victorian séance setting and discover that death is not the end but merely a doorway though which we all must pass! Finally, the séance will conclude with a blessing of gratitude and thanks. Tickets are $30 per person. Seating is limited so check back soon to reserve your tickets using your credit card! Ticket Sales are Final. Click Here to Visit the OMEN Calendar and purchase your tickets! Please note: An authentic séance is conducted with honesty, accuracy, and a deep respect for those in this world and in the next. It is not a theatrical attraction but rather is for those who wish to make a real connection with the spirit world. All participants must be over 18 (those 14-18 accompanied by a parent or guardian who gives full permission). No latecomers shall be permitted under any circumstances! For questions about Messages from the Spirit World, click to email OMEN. Subscribe to The Scarlet Letter! Get monthly updates for Festival of the Dead, HEX, OMEN, and Salem Witch Walk!